We know you’re spending a bunch of time thinking about how your homepage looks. We get it. It’s your front page. You want to pull it up and be proud of it. You also want your readers to like it enough to come back, to spend some free time perusing. If you want to look real good — like, going-to-Senior-Prom good — you’ll use the advanced layouts on occasion (i.e. when applicable for a type or length of story). 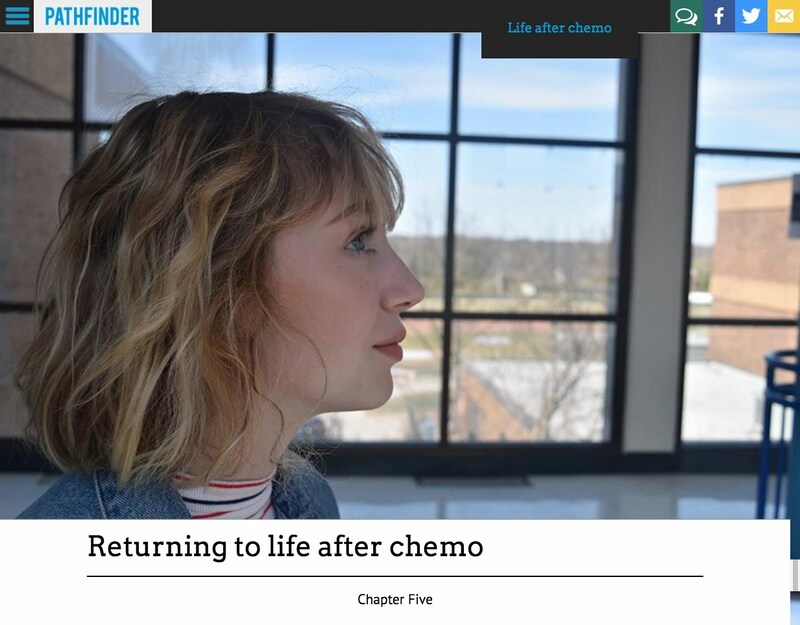 We’re talking about the Side-by-Side, Grid and Long Form templates, which can be selected in the same area of your Edit Story screen you select the other template options. These take a little more work to build. You need to plan for them, which is why we have Online and Web Editors on our staffs. Then, you need to execute it, and that can be confusing without practice. It involves creating a Container Story, which is what’s going to show up on your site, and then attaching separate Chapter “stories” to it and leaving those Chapters “Uncategorized.” There’s great information about templates here, and even more helpful guides about building them here, here and, oh yeah, here. Go slow your first few times through it. Ideas for using this template should come pretty easy. 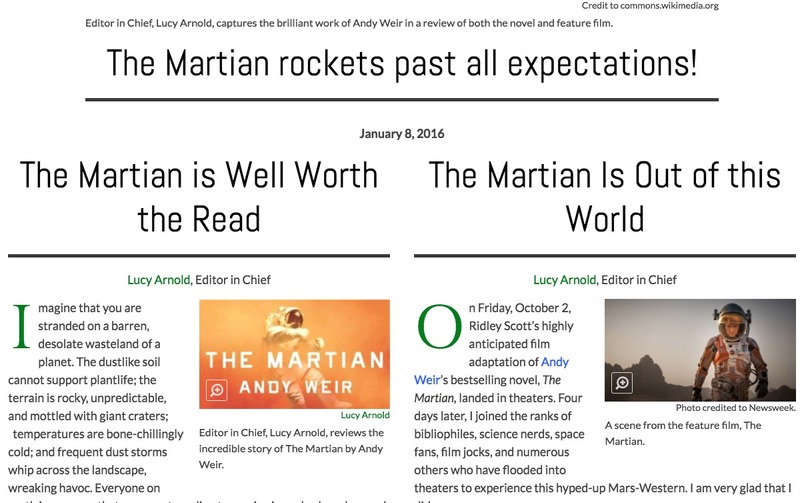 All you’re doing is presenting naturally paired content side by side, like the Peninsula Outlook has done to showcase reviews of The Martian — the book, then the movie. Another clear use for this: Pro/Con columns or any kind of opposing viewpoints. Here, the Peninsula Outlook built a Container Story featuring only a Featured Image and main headline. It gets you right into the two reviews, each a Chapter Story featuring a photo and several pull quotes. They also ensured the two stories were similar in length to create a nice, balanced page — strive to do that as well. 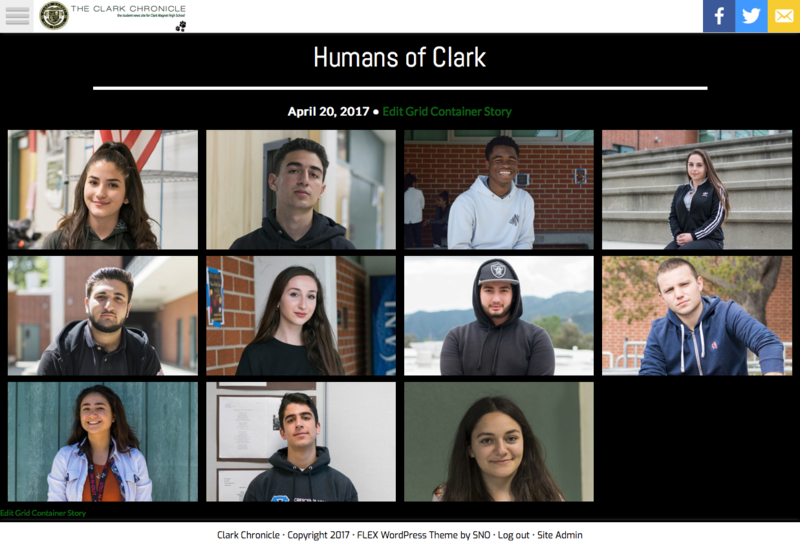 The way to do a “Humans of Clark” series (but your school’s version) is split, it seems. Some publish stories within a category for it. Others do what the Clark Chronicle did here. And it makes good use of the Grid template! All they did was create a Container Story — in this case, it’s only the headline — and then continually add Chapter Stories (or “Humans”) to it throughout the year. With nice feature images of each person and your black background Color Overrides on, you get a pretty slick photo grid to show off your series. These grids are packages, collecting similar stories. They’re not photo galleries. Each photo on the grid links to a live story. So, use it for a “Best of” showcase at the end of the year, package together all your Homecoming content into one space. You could also do something like this other school did. This is one, big, in-depth story — or, in Pathfinder’s case, a kind of running reporter journal that turns into a good feature piece. As a running journal, they attached further Chapter stories to their Container (the top and first part of the article) consistently. They incorporate tons of graphics to really make this piece stand out, including the top Immersive Image and several other photos. If you have a multi-part feature story (maybe one with several subheads or chapters within the story), this template is for you. Some use only the Container, just to get the Immersive Image feature. You can, too, but that won’t get you points when you’re applying for the SNO Distinguished Sites Story Page Excellence Badge later this year. Using all three of these templates appropriately is required for you to earn that Story Page Excellence Badge. That’s right — you can earn a badge for knowing and using this stuff. That’ll just get you one step closer to becoming a SNO Distinguished Site. Do you have your own great examples of the SNO story page templates in action? Share them here.